Just because it is better than it was, does that make it the best we can do? This is part of the “good enough” resolution or avoid-any-more-hard-work ethos. Is time so precious that we cannot invest in doing better? These restricted environments were a necessary part of the research process of seeking evidence and we are indebted to the work of the scientists and how it has enriched our world of training and learning about dogs. One element integral to the process was to measure the success of the experiment by the rate of response, where 80% was calculated as successful. The rate of response was of a press of a lever or peck to a disc. How the behaviour was carried out was not measured – with joy, distress, pleasure or anxiety. These are factors we have an interest in monitoring today. Here I need to explain the phrase “was of its time”, in other words, yes, it was accurate at that time with the knowledge and understanding of that time (1940 – 50s). With today’s knowledge, understanding and experience we can expand on that statement, ignore it or update it. Without doubt we should have moved on and not be still considering 80% a success rate, otherwise we are just coasting. If we are not getting better at what we do and just coasting along we are wasting our valuable resources of our time, energy and this dog, here and now. We do not strive to get better at watching TV, but we often strive at making better coffee, eating a better diet. As dog trainers and learners we should be striving to improve our training all the time and for everyone. No coasting. We need to make an effort to look in diligent detail at the inherited presumptions and not just carry on the way it has been done in the past. The phrases guaranteed to excuse coasting: “better than it was” and “everyone does it”. Positive reinforcement training is overloaded with coasters. 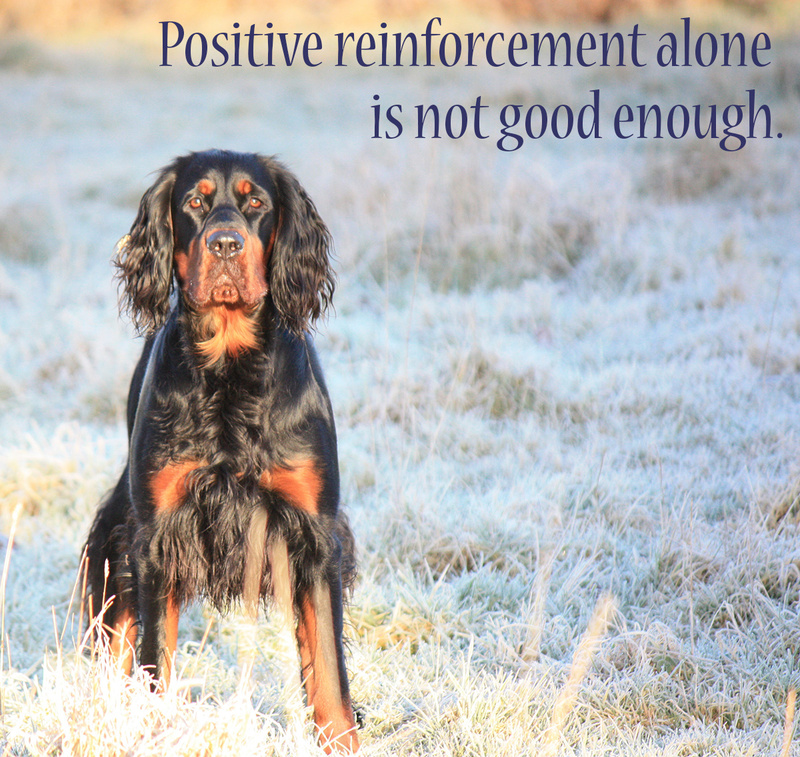 There seems to be strong motivation to make the leap to positive reinforcement but to then stand still, as if positive reinforcement alone is enough. It has as much inclination to become sloppy as any other protocol and deteriorate beyond what it used to be. An 80% success rate on a “return to me” call is not good enough. That means on 1 in 5 occasions it is unsuccessful. It is certainly not a good enough ratio of success for me. I measure success in the way the behaviour was carried out AND the rate of success. 98% is closer to my standard. Here is an example where the protocol or recipe “was of its time” but we should not carry on coasting and avoid the hard work of learning more and learning to be better. These come in many varieties, from the “aah-aah” to prevent food being taken from the hand, the fist closing or withdrawal of the food hand or dog bowl. If you need some enlightenment you can begin here. These protocols all rely on an extinction process. The pup or dog will see an opportunity to take a piece of food, in the hand, at the table or on the floor and “make the error” of trying to get it. When doing so the opportunity is removed, in a variety of ways some more obnoxious than others. The outcome is a dog that is now confused on the presentation of the stimuli: food in the hand, and hands in general. The protocol is justified on the basis that the dog made an error that needs to be extinguished, and that it builds resilience. I see a dog deliberately set-up to make the error. The Person tells the dog “leave it” and reinforcement is delivered for backing off, or averting interest in that available opportunity. Reinforcement is delivered for the absence of a specific behaviour (taking the food). For some dogs that offered a consistent aversion to taking the food, this reinforcement of an alternative behaviour may work. But for dogs that offered several avoidance behaviours all of which receive reinforcement we are just embedding confusion. 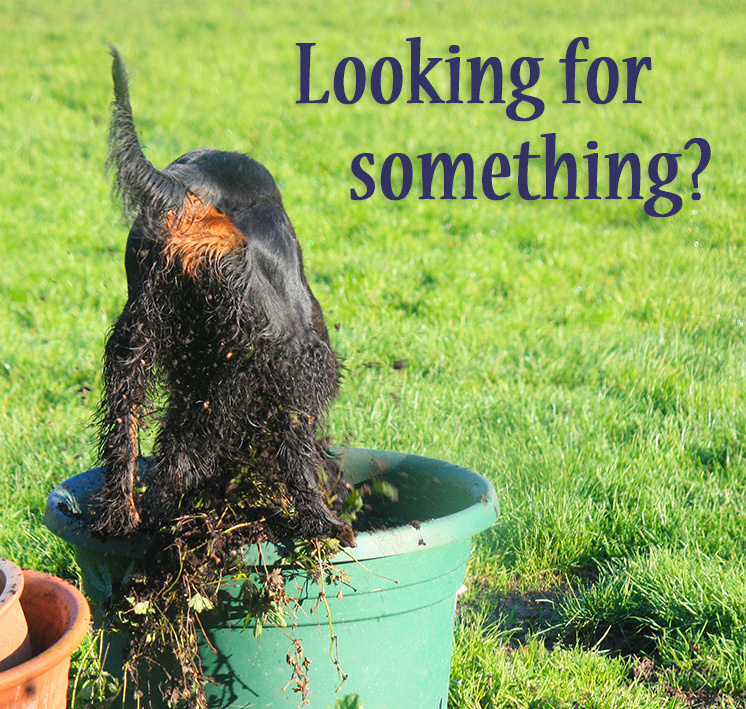 The dog will begin to hesitate when they scent food is in the environment and likely begin to wonder what they should NOT do, rather than the same stimulus trigger thoughts of what they CAN do. If we believe the marketing and wishful thinking this is supposed to teach impulse control, but as much as the threat of speed cameras reduces speeding: when they think they can be caught. The addition of the cue “leave it”, is justified so that “in real life” should your dog approach a chicken bone on the ground you can shout “leave it” and they will halt their progress. That is neither impulse control nor training by positive reinforcement. It also requires The Person to be vigilant at all times so that they can act as a speed camera. Perhaps we all know the outcome of “no speed cameras on this road” …….. speeding? We may just as well teach the dog “no”? 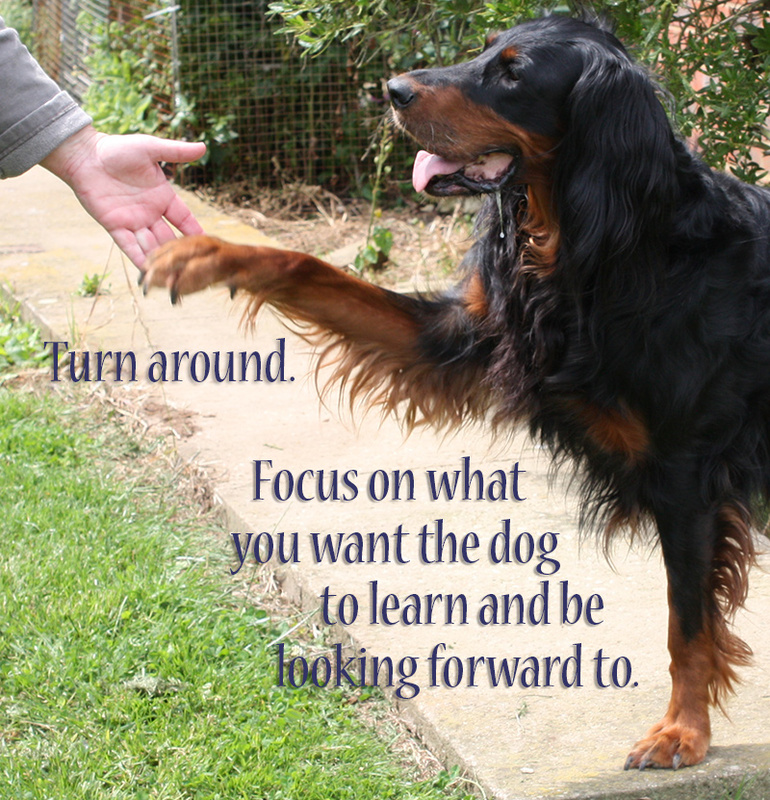 Let’s focus ourselves on teaching the dog what we want them to do, and find lots and lots of different ways to reward them for doing that. I want my dogs, in particular young learners laying down their foundation skills, to view their environment as opportunities to earn. Earn food, earn affection, earn interaction with enjoyment at the root. If I considered a future of walking amongst chicken bones, then I would teach the dog a specific return to me behaviour that I would recognise so that I can supply a reinforcement, much like mine detection! This is Just Training, not impulse control, just learning that when that stimulus is present then this opportunity of reinforcement is available, and it is reliable. The Leave It trained dog is likely to smell the chicken bone, check if the owner is looking (speed camera working) and make a rush for the bone before the owner is awake. Then we have to progress to the Drop it protocol. We want to focus our effort and resources on teaching the dog what to do when they smell chicken. Beginning with the scent of the food, in a container out of reach of the dog, when the dog engages and enquires to you, you can step to the container and collect a piece of food. This should be delivered in a smart, no hesitation fashion, to where the dog is at that time. For folk unsure of the hand to mouth delivery it is good to practice this in advance of delivering a piece of food. A marker would help clarify to the dog what earns the “Person Goes Shopping for me” process, but equally of value we need to ensure we do not actually teach the dog to make a lunge toward the hand as it approaches to feed. We need a clean, prompt arrival of the food, in a “pony-style” hand direct for the dog to take the treat without the need to move. If we look carefully at the image where she is taking food from my hand, note that there is no loss of balance, she does not have to reach forward to get the treat, or move backwards. It is exactly where she expects it to be, and she can eat directly off the palm with ease, no stress or extra effort. This process needs a bank of repetition upwards of 20. The dog will get a substantial amount of information, understanding and food for holding position (it can sit, stand or diddle on the spot) and engaging with Person. This is paired with the continual scent of food. The dog will learn that engagement and enquiry, the silent type not the vocal type, pays off under these conditions. Reliably. The dog will learn to trust hands that deliver food, WILL deliver food and not pull back at the last minute. 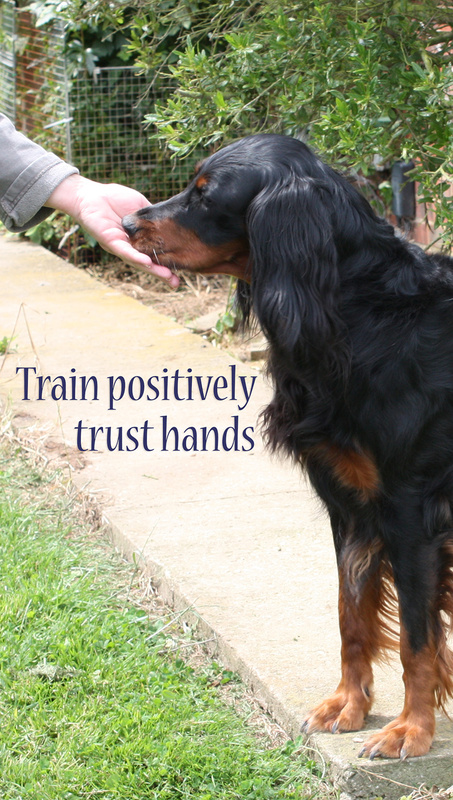 This is positive all the way: the experience the dog will enjoy, the engagement as the foundation for training and interaction, safe hands, and perhaps gobby hands, but they can be washed. But if the gob-on-hand is an issue, have an empty food bowl adjacent to the dog and drop the treat to the bowl or put the food in a cup on a stick and put the food to the floor in front of the dog, or lion. Once this process is established, upward of 20, then we begin to fade-in food in the hand. Since we are the lucky owners of 2 hands, I would suggest the non-active hand holds a couple of treats in the early introduction, not the hand that delivers. When we see solid, “I smell food, where’s my Person” behaviour we can progress to delivering from the hand containing food. My recommendation is to keep it variable. Sometimes from the food in-hand supply, sometimes a step to the food container, sometimes a journey to the fridge. But it is a lifelong, reliable rewarding process. 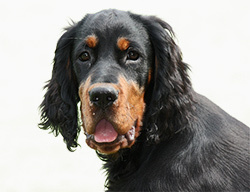 The reinforcement process is then extended by including behaviours she likes to do. To apply the fade-in protocol for the misbehaviour of speeding, we would design an engineering gizsmo that prevented an excess speed along a specific track of road, perhaps a road-type where limited speed should become a conditioned response – a residential street. As the driver progressed, fuel bonuses would be added, rewards for maintaining the restriction, even though making the error was restricted. This is the same as a box of treats, out of range on a unit or work top. Error is restricted. Much mileage is achieved in these types of streets. Very slowly the residential area is faded away and the road opens up to “tempt” acceleration. As the driver maintains the limit, more bonuses are added, and these increase depending on how difficult it becomes to maintain. Additional bonuses or rewards, can be offered, time to enjoy the views, a stop for a coffee, good conversation with a passenger, podcast from the radio. Including the satisfaction from adhering to the rules, removing potential dangers and arriving safely. the dog will focus on what to avoid. We are still unfortunately in an industry where training practices deemed “not sh*t” are ok because they are better than the alternatives where punishment is used frequently. Articles like these are massively helpful but there may be a lack of motivation in many to learn this stuff as it requires expanding your comfort zone. If I hadn’t had you as one of my primary influences, I’d still be in the dark ages, hopefully I’m getting there. I love this approach to “leave it”, I haven’t been happy with my own approach to teaching this to my clients. I have paired a cue with food but the bridge for understanding has been lacking. The result of this is that you have to be on alert on your walks and to pick up the changes in your dogs body languages very early. I am now in the process of thinking how I can teach my dog to mark on chicken bones in the nature very similar to nose work I am sure we both would enjoy this a lot and a new step for me in becoming a better trainer. Sounds an excellent idea for a nosework project! I purchased a handful of small cages that hold bird food, I think fat balls etc, and placed the “I’d rather you didn’t eat this” inside, so that it was not consumable and the dog needed to alert to me (with a return and indicate). On some occasions we would Go To the source and I would use my special tools (thumbs) to open the cage and deliver the goodies, other times we would go to a completely different source for reward. I do think running with the dog to a source is an intricate part of the pleasure for the dog, not just return to me for food from my pocket. A great game, we call “chicken in a basket”, and many variations can really help the dog with a fun and interactive activity. Awesome! It’s really nice to notice how positive is not simply a technical term but you really make an effort to carefully train in a positive way. Thank you! I have also been thinking about the leave it training a lot. I train it with the hand in a fist at first to avoid negative reinforcment of the closing hand. However there is still always the extinction part where the dog tries to get the treats from the closed hand and only gets the click and treat when it stops. I started to doubt this system when i realised that my newest addition to my furry family was not really “fighting for the reward” because she had learned that “giving up” is the way to get the treat. I think I will change the way I teach clients now as well so that there are no “hands involved” in anything but the reward. The only thing I was wondering is how would you react if instead of orienting towards you the dog would’ve gone and done its best to get the stuff in the box? Or is the box truly out of reach in the beginning? For instance too high for the dog to reach it. Thank you for this… mind blowing!! :D!! If Merrick had helped herself to the chicken …. I would have sighed … and then and cooked some more, but started the next session differently. She has be familiar with “available” food from a puppy. Although I could put the food on the floor in the box for the collies, that would be a step too far for her at that age. She is about 14 months here. There comes a point when free food is just free food, I often have scatter parties in the garden, especially when there are deliveries at the gate. Training with me is more than a piece of food – it is the signficance of me collecting the food, choosing what is best for her and then delivering it with sincerity. I think anticipation plays an important role.